Pernix Therapeutics Holdings has introduced Omeclamox-Pak, a ten-day therapy of omeprazole delayed-release capsules (20mg), clarithromycin tablets (500mg) and amoxicillin capsules (500mg) for the treatment of Helicobacter pylori (H. pylori) infection and duodenal ulcer disease (active or one-year history) to eradicate H. pylori in adult patients. Omeprazole, a proton pump inhibitor, works by decreasing the amount of acid the stomach produces. Clarithromycin and amoxicillin are antibacterial drugs, which inhibit the growth of bacteria allowing the stomach lining to heal. The medications are to be taken together, twice daily, for ten days. 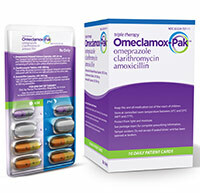 Omeclamox-Pak is expected to be available by prescription in July 2012. For more information call (800) 793-2145 or visit www.pernixtx.com.